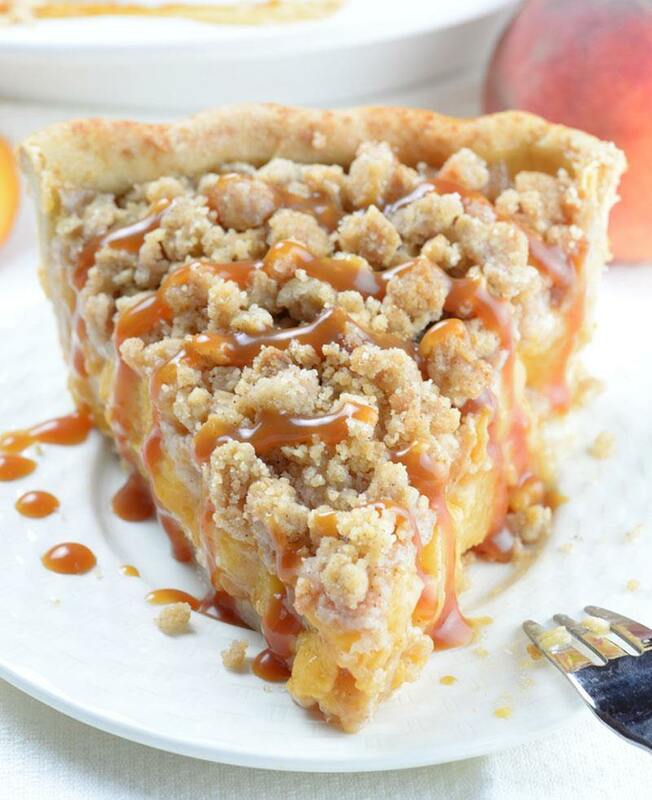 Since a few months ago when I found this great Salted Caramel Peach Crumble Pie recipe by Kelly Jaggers from Evil Shenanigans , I could not wait to get first fresh peaches just to try this mouthwatering pie. 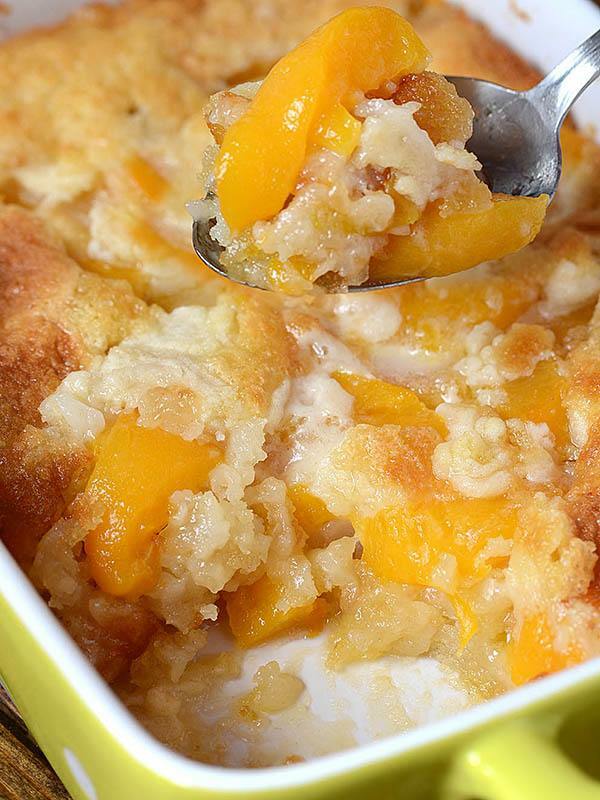 I love peaches, what you probably already realize, if you saw all my recipes with peaches : Super Easy Peach Cobbler, Peach Dumplings, Fresh Peach Delight and Simple Peach Cake. Of course I had to make Peach Smoothie too, because like I said I love peaches . Every dessert that include peaches simply must be tested in my kitchen. Beside their wonderful aroma and taste, I like fresh peaches from one more reason, they are sign that summer is finally here! Beside fresh, juicy peaches I’m totally crazy about sweet and salty combo, so this recipe with salted caramel, seemed like a winner to me. 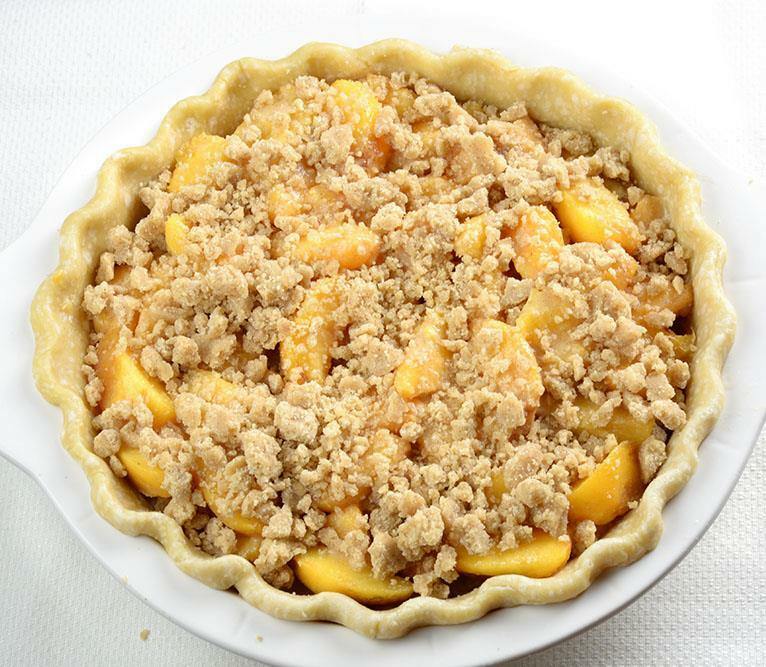 Finally, a few days ago I found first peaches on the market so I had to grab them immediately and rush back home to make this delicious Caramel Crumble Peach Pie. Again, I made my favorite buttery pie crust, sliced the peaches and toss them with corn starch and salted caramel and pour into pie shell. 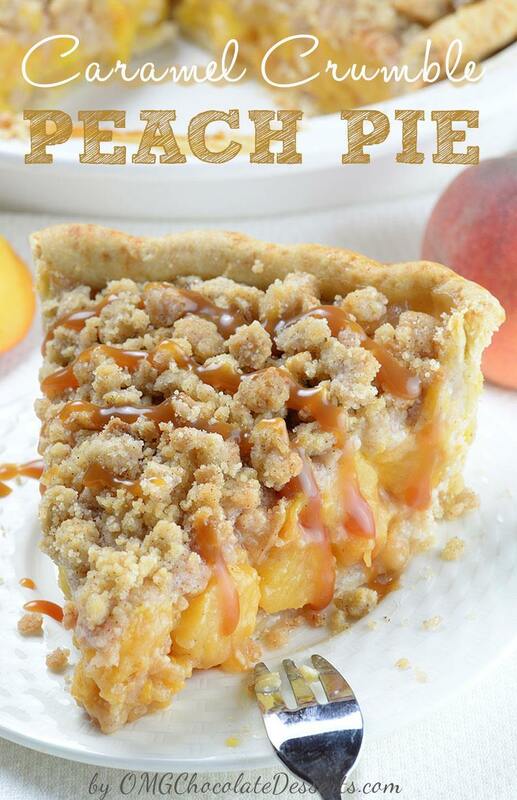 I have to admit, althought I made homemade pie crust I used shortcut and took store bought caramel sauce because I was so anxious to finish and finally try this Caramel Crumble Peach Pie. For the topping I made brown sugar cinnamon crumbs to make it extra special, because brown sugar-cinnamon crumbs are so addicting just by themselves. And in the end I finally got my Caramel Crumble Peach Pie in front of me. I cut a huge slice just for myself, drizzled it generously with salted caramel sauce and I was totally crazed about that sweet and salty, buttery goodness overloaded with juicy peaches. 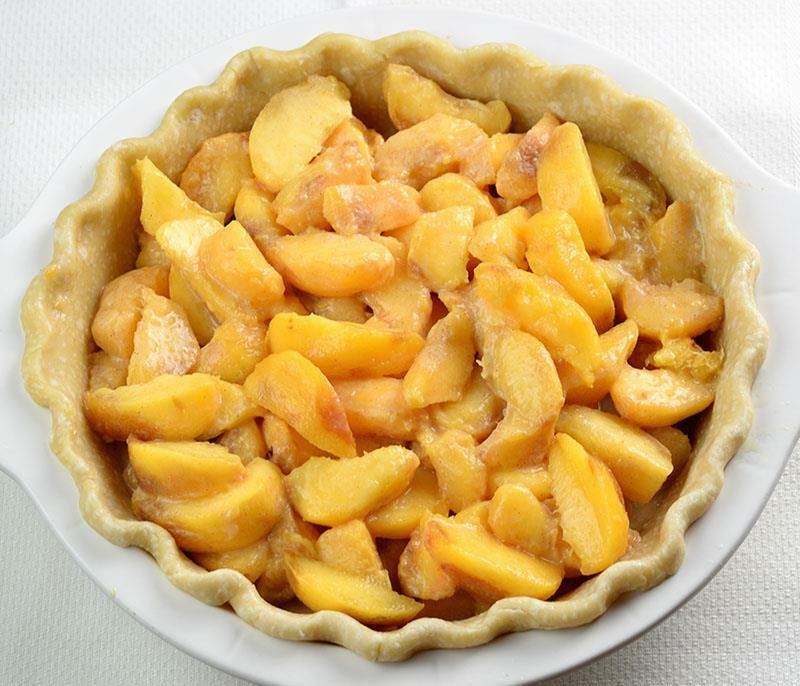 If you don’t like sweet and salty combo you can go with regular caramel sauce, but if you are a peach lover you have to put this Fresh Peach pie on your to do list this summer. In food processor pulse flour with sugar and salt, then add cubed chilled butter and pulse until it resembles coarse meal. If you don’t have the food processor use pastry blender or fork. Add three tablespoons ice water into the mixture and pulse. If necessary add (one by one) two more tablespoons ice water and pulse. The mixture should holds together when squeezed but do not overmix, it should look crumbly. Shape the dough into a disc and wrap, set in the fridge at least 1 hour( you can store it overnight in the fridge). Dust the work surface with flour and roll out the dough to make 12-13 inch circle, transfer it in 9 inch pie dish, fold the edges and crimp with your finger. Set in the fridge while prepare the filling. 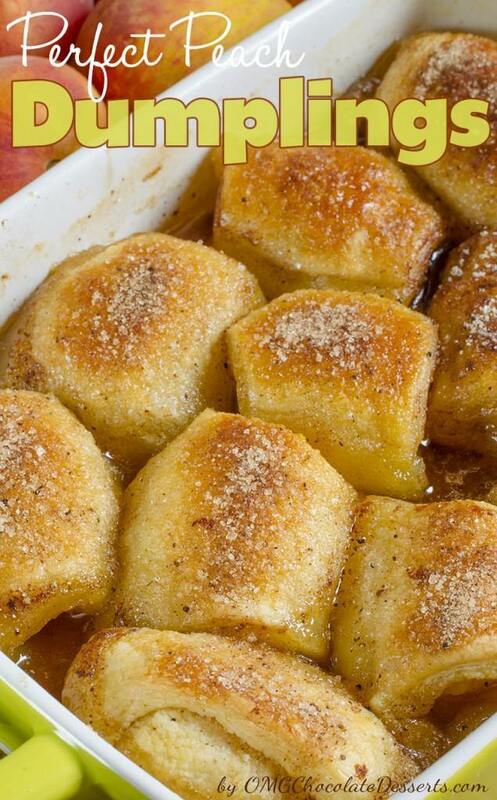 Stir together with a fork granulated sugar, brown sugar, cinnamon, dash of salt and flour. Add cubed chilled butter and press it with a fork to combine evenly. The mixture should look like pea sized crumbs. Set in the fridge until ready to use. Peel the peaches, remove the stones, slice into ½ inch slices and place in a large bowl. Add cornstarch mixed with cinnamon, then add salted caramel sauce and toss to coat them evenly. Let it sit at room temperature for 10-15 minutes then pour it into pie shell. Sprinkle with the crumbs and place into preheated oven at 425F. After 10 minutes REDUCE THE HEAT TO 350F and bake for 45-60 minutes more or until the top are golden brown. NOTES: place the baking sheet under the pie pan because the filling will bubble to prevent dripping onto oven! Cool to room temperature before serving. It will sliced and lift easier when it’s completely cooled. This recipe looks wonderful but there is no ingredients for the salted caramel sauce. Could you tell me how to make that please? 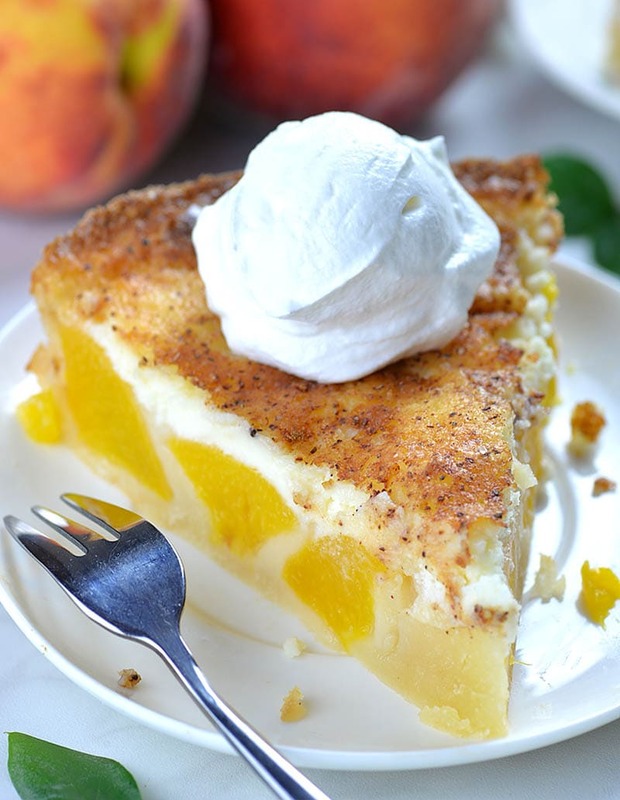 At the top of the page under the first picture of the pie there is a link called: Salted Caramel Peach Crumble Pie recipe – click on this link and it will take you to the original recipe that is a bit different than this one. Then, in the list of ingredients on this recipe there is another link for the carmel sauce that is used in a apple cake recipe. Good luck! Are we supposed to use the entire crumble on top? I covered my pie and still have about half left. Very excited to see how it tastes! Same with me..too much topping! Would it be okay to use frozen peaches? Hi Dieterrr, I haven’t tried with frozen peaches.Maybe you should add an extra tbsp. cornstarch in the filling. 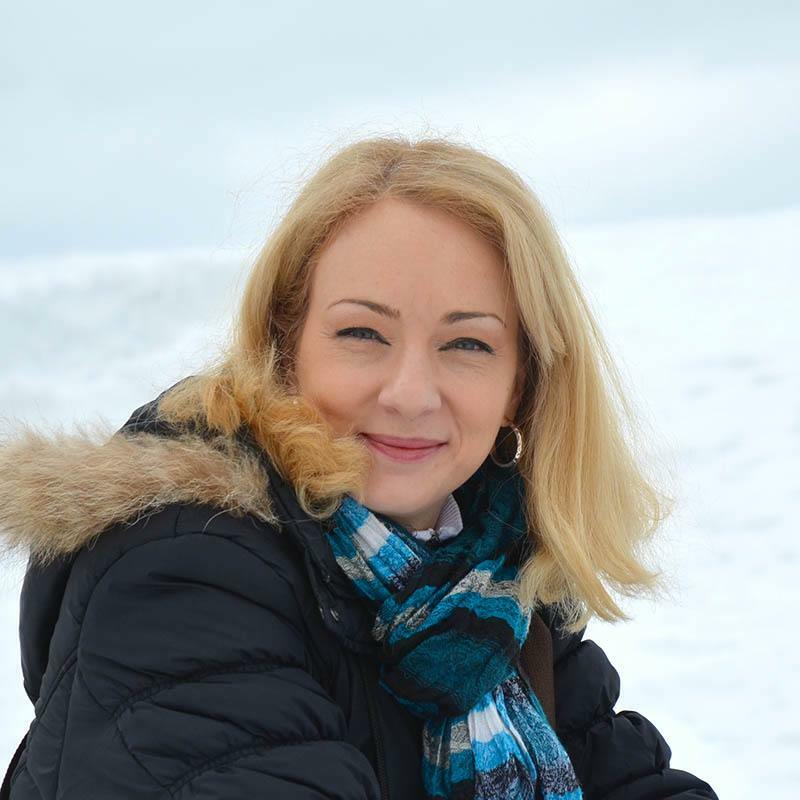 Hi Vasso, you can refrigerate the dough for the pie for a few days and you can make the crumbs ahead and refrigerate it,but do not assemble the pie before ready to bake.